Research has shown that learning music at a young age can be a huge advantage later in life. 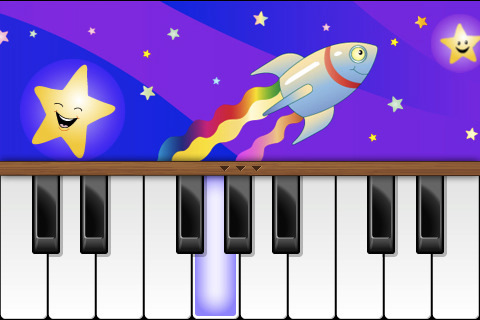 Now you can start your young one on the piano with Oneapp’s educational game app, titled Twinkle Twinkle Little Star Preschool Storybook Piano (or even if you have a passing interest in learning how to play plano). As the title suggests, the musical focus of this app is in the nursery rhyme, Twinkle Twinkle Little Star. There are four ways users can experience this song, all of which can be accessed from the home screen. The song beings once the Start button is tapped. In Play And Sing Along, the piano key associated with the note being sung will light up for you to play along with. There are no words in this section, but Karaoke Mode can help you learn the words in English, French, and Spanish; Free Style Mode features the words, but no highlighted keys. For more advanced users, Learn the Song shows you the music note on an actual staff along with highlighted keys. In all sections, tapping the button with the piano keys will roll out a menu in which you can change the instrument sound; the barnyard animal one is especially interesting. There is also an option to record yourself singing and playing the piano on the app, but you’ll need a microphone for that if you’re on the iPod Touch. The menu hides itself during the song, so tap the brown bar right in the middle to reveal it. Unfortunately, there is no pause button, so every time you stop, you’re sent right back to the beginning of the song. AppSafari review of Twinkle Twinkle Little Star was written by Julie Guan on July 17th, 2010 and categorized under App Store, Education, Music. Page viewed 5916 times, 2 so far today. Need help on using these apps? Please read the Help Page.